Tonight... Rain. Low around 43. North wind 10 to 15 mph, with gusts as high as 20 mph. Chance of precipitation is 100%. New precipitation amounts between a half and three quarters of an inch possible. Friday... Rain, mainly before 4pm. High near 47. 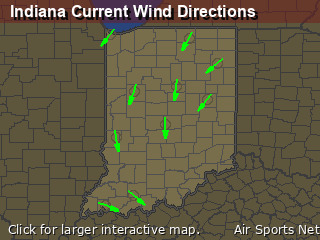 North wind 15 to 20 mph, with gusts as high as 30 mph. Chance of precipitation is 90%. New precipitation amounts between a quarter and half of an inch possible. Friday Night... Rain likely, mainly after 8pm. Cloudy, with a low around 37. North wind around 15 mph, with gusts as high as 30 mph. Chance of precipitation is 60%. New precipitation amounts between a quarter and half of an inch possible. Saturday... Rain, mainly before 2pm. High near 49. North wind around 15 mph, with gusts as high as 25 mph. Chance of precipitation is 80%. New precipitation amounts between a quarter and half of an inch possible. Monday... A 30 percent chance of showers and thunderstorms after 2pm. 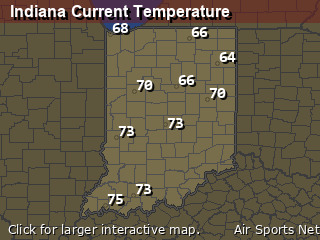 Partly sunny, with a high near 73. Monday Night... A chance of showers and thunderstorms. Mostly cloudy, with a low around 52. Chance of precipitation is 50%.